of is het de lp the impossible dream ? This number was written for the 1965 Broadway musical "Man Of La Mancha," in which it was first sung by Richard Kiley. It summed up the ambitions of the show's hero, Don Quixote, the character played by Kiley. In the notes to his "Greatest Hits" LP, Jones says, "I didn't even want to sing the song. I love Richard Kiley, but when I saw the show, I didn't think I could make the song work for me." 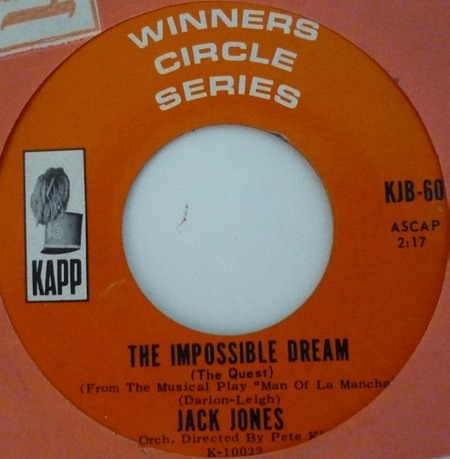 Jones's version reached #1 in the easy listening chart and #35 in the pop chart of the USA in 1966, earning a Grammy nomination for Best Male Vocal Performance.